As Donald Trump starts his first week as president, how he and congressional Republicans plan to proceed on their first priority of repealing and replacing the Affordable Care Act remains a mystery—even to Republicans. Trump and Vice President Mike Pence both said last week that the administration will soon unveil its own plan to replace Obamacare. They seemed to disagree, however, on whether the plan would provide “insurance for everybody,” as Trump said, or simply would mean “making insurance affordable for everyone,” as Pence put it. Trump is scheduled to meet Wednesday with congressional Republicans in Philadelphia to discuss the administration's legislative agenda, and healthcare is expected to be the top issue. Meanwhile, healthcare industry groups are stepping up their lobbying to quickly repeal the ACA's taxes and spending cuts, which could sharply narrow the options for crafting and financing replacement coverage. Some Republicans and nearly all healthcare stakeholders think the GOP better have some replacement plan ready very soon because Congress already passed a budget blueprint that could lead to expedited legislation to repeal the ACA on a party-line vote as soon as next month. “It's really irresponsible to repeal the law with no consensus on replacement, because you're playing games with people's lives,” said J.B. Silvers, a professor of healthcare finance at Case Western Reserve University and former health plan CEO. 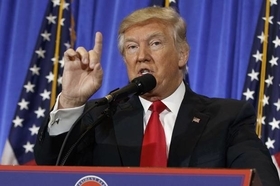 Trump's executive order Friday instructing federal agencies to go as far as they legally can to roll back the Affordable Care Act only intensified the pressure. A new bill introduced by Republican Sens. Bill Cassidy and Susan Collins indicated that many Republicans realize the heat is on to pass an ACA substitute package quickly. The senators described it as allowing states to design their own coverage replacement models, letting them keep the ACA framework if they want to. States would receive the same amount of funding they get under the ACA for expanding coverage, Collins said. Depending on the details, that concept could draw Democratic support but may not go over well with hard-line Obamacare foes. In a National Review article last week, conservative health policy expert Yuval Levin tried to reassure his readers that Republicans are coming together both about the substance and strategy of their healthcare reform plan. Still, there's plenty of fog emanating from congressional Republicans themselves as they offer various replacement outlines, white papers and legislative proposals. One major question is what kind of financial assistance they will offer consumers in buying health plans. Most propose some type of refundable tax credit based on age, unlike the ACA's tax credits based on income. House Speaker Paul Ryan's Better Way white paper doesn't specify how big the tax credit would be. A bill from Rep. Tom Price, Trump's nominee for HHS secretary, would offer $1,200 for people between 18 and 35, $2,100 for those between 36 and 50, and $3,000 for people 51 and older. That's far less than the average $4,600 tax credit provided by the ACA. In contrast, the very conservative Republican Study Committee recently unveiled a bill offering a health insurance tax deduction of $7,500 for individuals and $20,500 for families, which would cost the federal government less than tax credits but be worth little for people of modest means who pay little or nothing in federal income tax. There's also uncertainty about how and to whom the federal government would pay the tax credits. Some GOP proposals, similar to the ACA, would let consumers choose to have the credit paid in advance, on a monthly basis, to their insurer. Other proposals, such as one from Rep. Pete Sessions and Sen. Cassidy, would pay the credit into a health savings account. Some GOP proposals don't even address this question, which is important to insurers because they don't want to collect federal subsidy payments from consumers. Under GOP proposals like Cassidy's, the tax credit would go into an account and uninsured people would be automatically enrolled in a low-cost, catastrophic plan for the price of the credit. There are major questions, however, about the adequacy of that coverage, whether the public would see auto-enrollment as too heavy-handed, and the logistics of identifying millions of uninsured individuals. “The differences among these proposals involve serious trade-offs, and … most congressional Republicans have not thought deeply about them and are not immersed in the details of healthcare,” Levin wrote. It also remains murky how Republicans intend to finance their replacement coverage, since they are pushing to repeal the ACA's taxes, which finance the law's premium and cost-sharing subsidies, Medicaid expansion and Medicare benefit enhancements. Most of the healthcare industry groups affected by the ACA's taxes and and Medicare spending cuts originally agreed to those provisions as part of the ACA's grand bargain to expand insurance coverage and reduce uncompensated care. But now insurers, hospitals and other stakeholder groups are loudly demanding elimination of those financing measures as part of the law's repeal. The Congressional Budget Office estimated that abolishing the ACA's various financing provisions would reduce federal revenue by nearly $1.2 trillion over a decade. Even Republican lawmakers and analysts say that could leave their party with no politically popular, deficit-neutral way to help Americans obtain affordable insurance. Insurers and business groups argue that erasing the tax on health insurance plans, which is scheduled to take effect in 2018, would reduce premiums. The CBO projected that eliminating that tax would cost the government $87 billion over the next decade. “Repealing the (health insurance tax) now will ensure that consumers and small businesses are protected from a 3% premium increase Marilyn Tavenner, CEO of America's Health Insurance Plans, wrote in a recent blog post. Hospitals are pressing for rescinding the ACA's Medicare and Medicaid cuts, which were premised on hospitals getting more paying patients through the law's coverage expansions. “Our lobbying efforts are very focused on helping Congress understand that was the arrangement, and restoring some of those cuts would be appropriate,” Trevor Fetter, CEO of Tenet Healthcare, told the Washington Examiner last week. Case Western's Silvers questions the wisdom of insurers and other stakeholders in pushing for repeal of those financing measures, since they have benefited financially from the coverage expansion paid for with those revenues. “It's over once you repeal the financing,” he said.